A travel guide for technical marketing – get inspired and start exploring yourself. In this post I’m going to describe how to build simple online dashboards by rendering a mysql query in a HTML table. Using Tablesorter and Tablechart the output will not only become sortable but you’ll also be able to filter any column and display a chart of the resulting data. As an example I’ve used my wordpress database to query the number of posts I wrote over the years and display the resulting data in a chart. Sorting The basic functionality of the tablesorter-plugin. You can sort the table by clicking on each table-header. You can even pre-sort the table (these settings would go into the tablesorter-options.php file of my example-code). Math: I’ve included the math-plugin of the tablesorter-plugin. In this example the footer row dynamically calculates the sum of the posts (here 13). This is achieved by adding data-math=”col-sum” to the th-element of the table. Check out the documentation of the math-plugin here. Filter: You can filter each column by typing in the fields there. The calculated sum even updates dynamically. I’ve prepared an archive of the example to get you started. Please be aware that this my personal custom usage of the plugins. You probably have to adapt and expand the code quite a bit to make it work for your project. So let’s talk you through the code. I’m going to explain the most important parts – from there you probably just have to go and try/error yourself. To get started you need to fill in the connection details of your mysql database. Locate the following code block and edit accordingly. This is where you put your sql query. 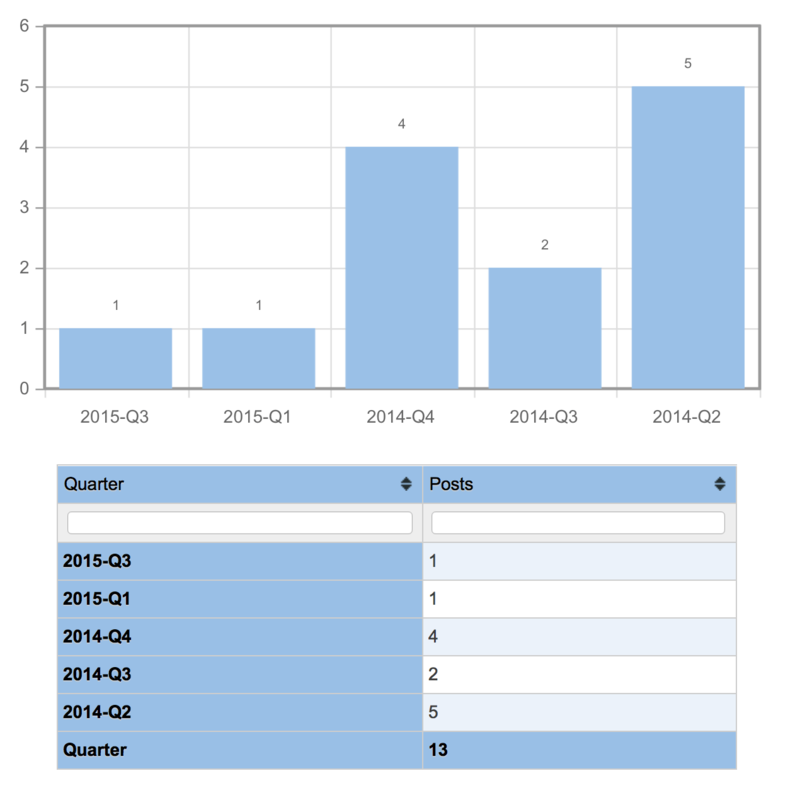 My query is a very simple one selecting the number of posts I wrote on this blog over time. The resulting data has two columns; Time and Posts. in the code and so forth. In this part of the code the Tablesorter and Tablechart jQuery Plugins get their settings & options. Most of them are quite easy to understand but at some point you probably have to read up about other options.